Leveraging data analytics and machine learning is one of the biggest allies for restaurants in increasing profitability and revenue. Restaurant owners and operators need to get comfortable with using their data to aid their business rather than getting scared of it and losing out. This showcase shows how machine learning can be leveraged for two main aspects of restaurants – Food waste reduction and staff optimization. 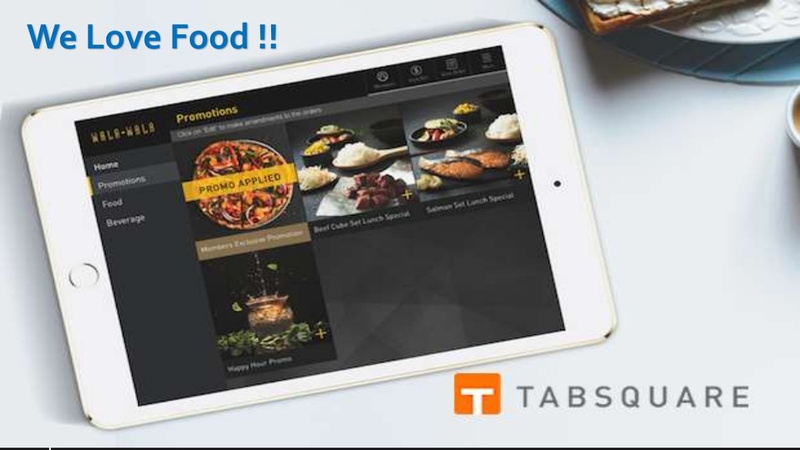 The data is from a product – Tabsquare, which is a restaurant management solution. The slideshow below talks about the hypothesis, facts and the technologies used into building such a solution. Post the slideshow, we will talk about it in more detail. 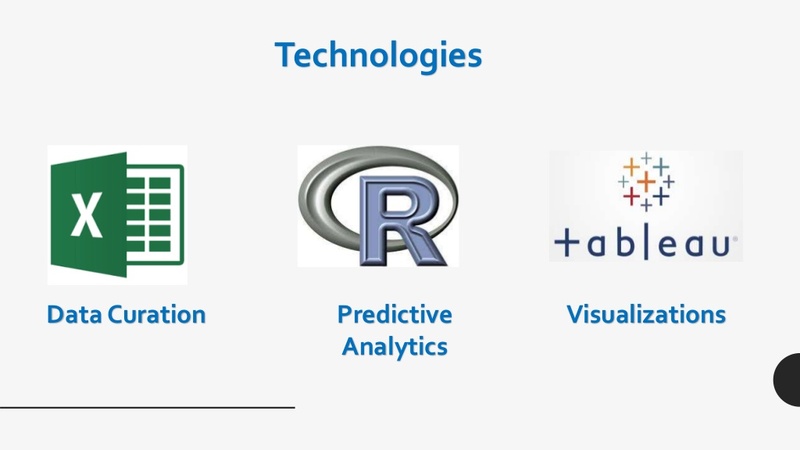 The approach primarily involves setting up the hypothesis, understanding the data and then employing advanced analytics techniques to aid the business. 1. Staff Optimization – The hypotheses behind this is that, restaurants are un-necessarily overstaffed or sometimes understaffed, due to which there is a hit on the revenue of the restaurant and the customers are also not satisfied with the level of service provided. In order to overcome this we employ machine learning to forecast the number of customers going to be present in the restaurant and number of tables which are going to be occupied in order to predict the requirement of the staff. This being said, the restaurant management can easily decide the number of staff to keep on an hourly basis in an optimized and easy to read manner (See dashboard for details). This can cut down on the incurred costs. 2. 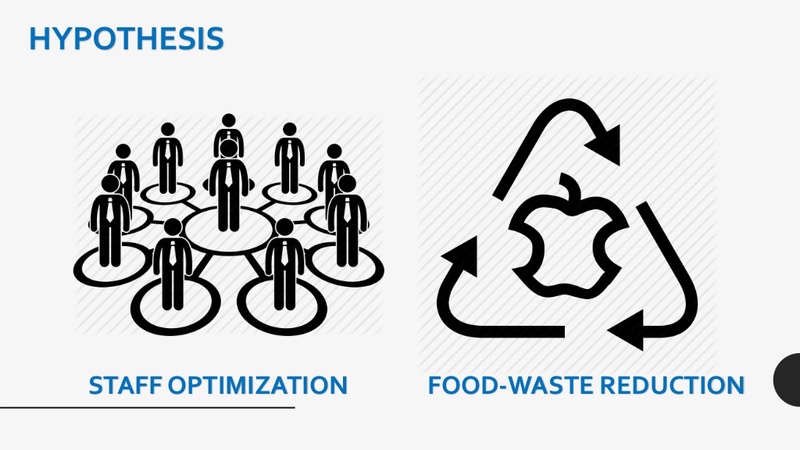 Food Waste Reduction – One of the critical problems all around the world today is the waste of food. This starts at the initial point of purchase of the inventory itself. ​What if we could reduce the unnecessary purchase of inventory? 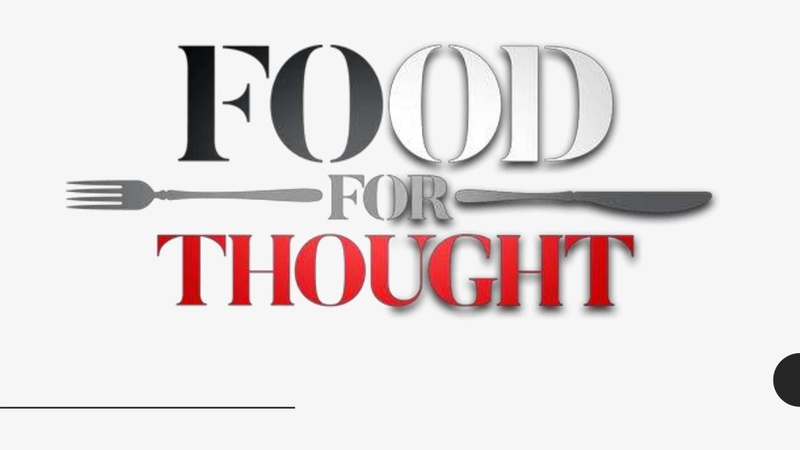 – This is exactly what we target to do, based on the historical consumption of food by the customers. Machine learning helps predict the requirement of different food categories every day, especially those with a low shelf life. This helps by reducing the stocking and hence food waste. This backtracks to less spending and hence more profit. Now, having said all that, how can restaurant managers and high level staff use these technologies to understand such trends? The dashboard below shows exactly that, a simple easy-to-use interface to interact with. 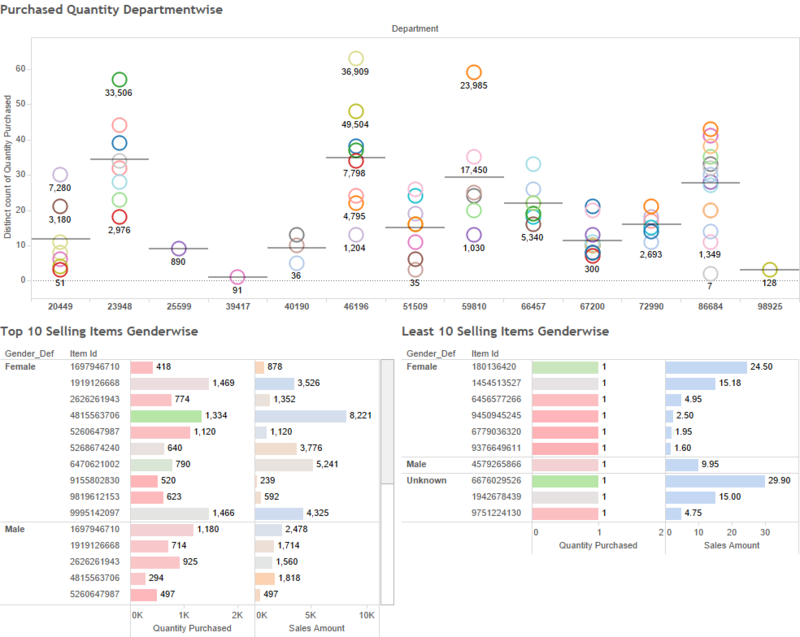 The above dashboard shows the effectiveness of visualizing the machine learning scenarios and how it can help the restaurants in improving their business. 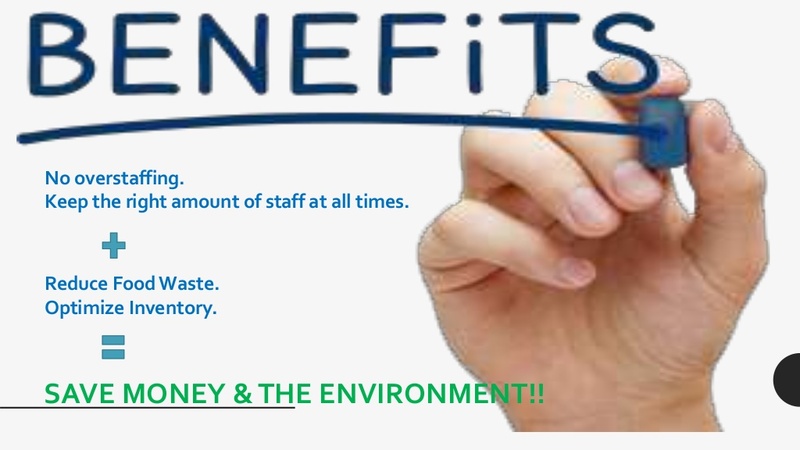 The advantages of having such an application deployed in the business is tremendous. If you think such an application resonates with you, please get in touch with us today. ​To get in touch with us, please click the button below. One of the major service industry is retail, where the value of the proposed innovation can be investigated by looking at the improvements made in several processes. This is analyzed via the Process Chain Network (PCN) Analysis. The following proof of concept was built by our team for Mustafa Center, which is the largest retailer in Singapore. 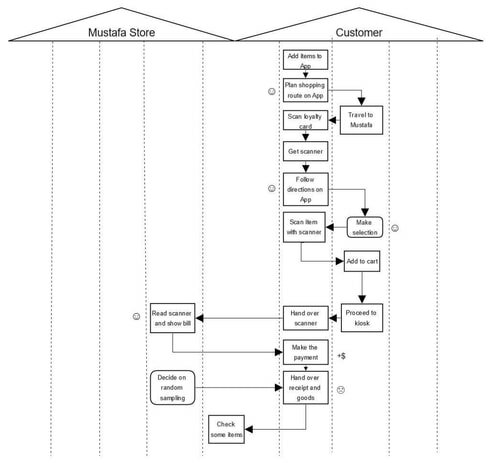 The above PCN diagram shows the chain of events during a typical shopping experience at one of the store. A customer arrives at the store, reviews his (or her) shopping list, and then must ask for directions to locate the product. Once the product is located, the customer can select from the wide choices of brands/prices, and adds it to his (or her) cart. This process can be repeated multiple times until all the items have been placed in the cart. Then, the customer goes to a payment counter, waits in the queue, and then makes the purchase. By adding the self-scanning concept and the online app to the shopping process, the overall creation of value is smoothened. 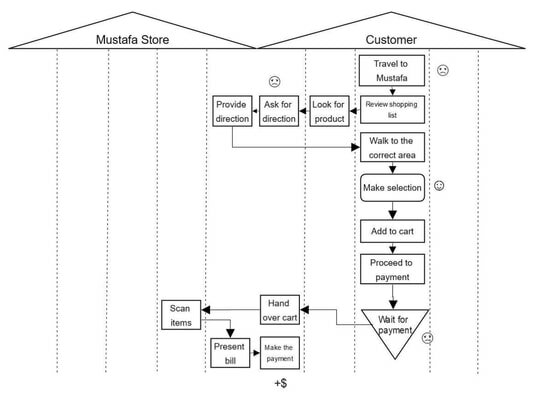 As visible in above figure, steps for (1) locating the product, and (2) making the payment are moved from a direct interaction to a surrogate interaction (towards the customer). This will help the customer by saving him (or her) time, and making him (or her) feel more independent. It will also free up some of the employees’ time. 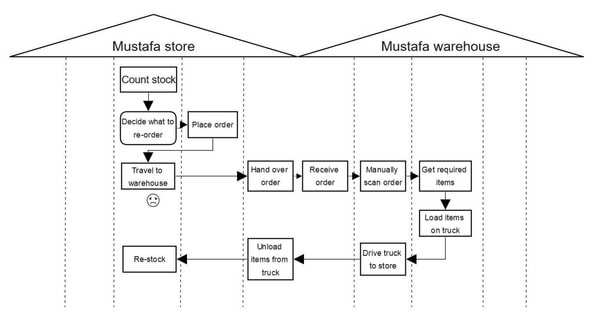 The PCN diagram here shows the chain of events during a typical re-stocking activity at retail store. In the store, people of various departments count the stock, decide the re-order quantity, and enter the order in an in-house ledger. Periodically, someone from the store travels over to the warehouse, and hands the list of items that need to be re-stocked to the warehouse staff. The warehouse staff then manually scan the order, get the items, and load them onto their delivery truck. The truck then travels to the store, where the items are unloaded, and restocked. More specifically, a dip in value is observed when a person has to travel over to the warehouse to hand over the list of items to them. In order to reduce the re-ordering burden on the store, the process of re-ordering has been moved away from the store to a separate IT system. Employees of the store will enter the stock information on the system. The system will automatically trigger a notification to the warehouse, when the quantity falls below the threshold level. The warehouse will then load the items into the truck, and send over the truck to the store whenever the truck has enough number of items needed to make a trip. At the store, the items will be taken out from the truck and re-stocked. The current supply PCN is assumed to be a standard supply chain network, due to the lack of specific information in stores. The new supply PCN would include one with the online platform concept. The PCN, shown above, details how retail store can sell even more niche products without having to stock them (and cramp its aisles even further). The store can host a two-sided marketplace platform, where smaller suppliers can display their products for sale. A customer can login to this platform, browse items and choose to buy the product. When the customer makes the payment, store notifies the small supplier, who then packages the product and dispatches it to the customer. We can help you build such innovative solutions for your new businesses. 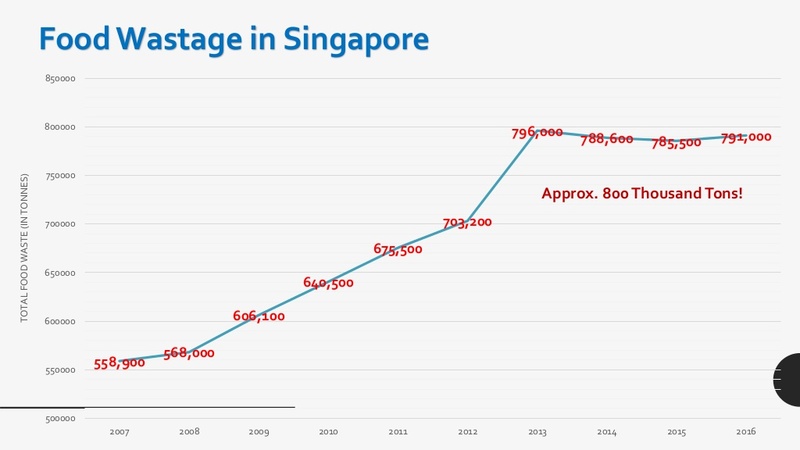 Singapore, and other countries, over the past few years, have seen a steep rise in the population of its elderly counterpart. A major problem with this rising elderly population is the need to address critical cases such as community engagement, healthcare, medical emergencies, financial crisis and so on. This showcase presents a unique idea for a device using IoT, as part of the Singapore smart nation initiative, which addresses a few of these problems. Community Engagement – In order to engage like-minded elderly people. ​Help on the fly – Deliver assistance to the elderly with the help of able volunteers. Medical Emergency – A quick response system which can help the elderly contact and emergency care unit. sThe elderly basically interact with the hardware components to call for medical assistance or volunteering services. The python code runs algorithms to do the needful and respond accordingly. 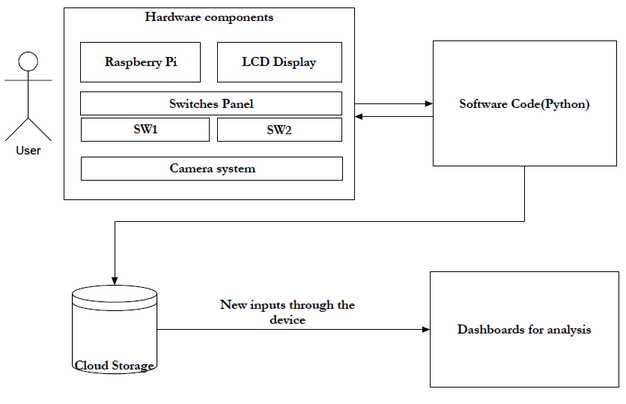 The cloud storage and dashboards are used for analysis. The basic flow for medical assistance and volunteering services are shown in the flow diagram below. The advantages of having such a system are numerous – it is a one touch system, cost effective, portable, scalable and can be used for numerous causes. The retail industry faces major challenges all around the globe due to new digital competition and customers becoming more informed and demanding. Regardless of this, retailers who are able to anticipate their customers needs and offer the right products at the right time, essentially come out in front. However, today, data is the new dimension to understanding the customer. 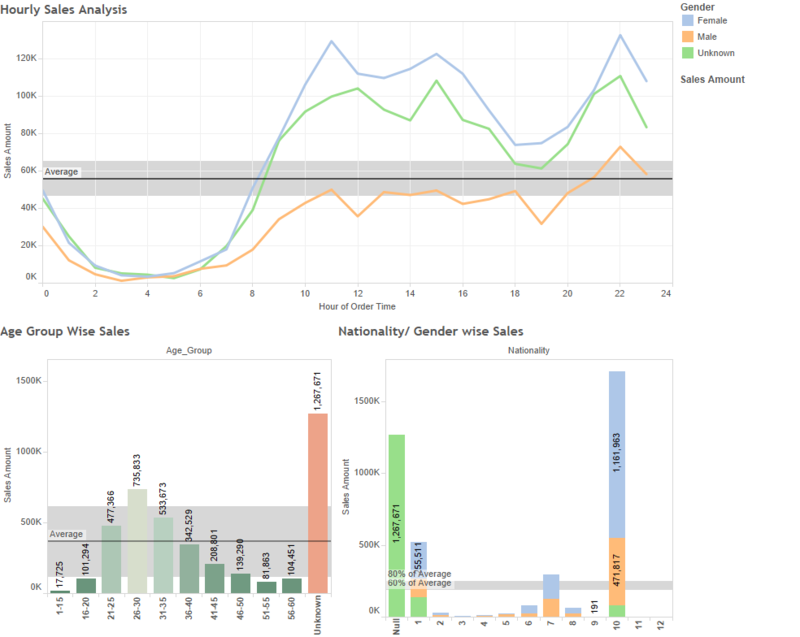 By enriching and analysing the data, we can help you analyse your products, sales and customer behavior. Further, we can help you deep dive into critical factors which can empower you with the information to make the right decisions and target the right customers. For the dashboards shown, the data used belongs to a one of the biggest retailers in Singapore. In the long run, using these golden insights and the right technologies we can help you build solutions around inventory management, demand forecasting, stock control, customer behavior analysis, cross selling and the likes. To get in touch with us, please click the button below. Real time and near real-time analytics is crucial across many sectors, traffic and roadways being one of them. With roads getting busier by the day due to increasing traffic and speeds, it is critical to monitor disruptions at all times, be it accidents, breakdowns or any other hindrances. This is to ensure that the disruption is attended to immediately and traffic is smooth at all times. A large number of analytical and machine learning solutions are created around traffic and roadways to take care of any possible threats. For one of the use cases, we built a PoC around road disruptions, specifically accidents. The system analyzes real time road data and images to analyze any cases of accidents and immediately alters the nearest rescue facilities like hospitals, police and fire stations with the exact location and criticality. This is done so that immediate action can be taken without any delays. Minimization of delays is the key aim here. A sample dashboard of the system is show below. It highlights how the accident information is communication in real time. If you are interested in the above showcase, or anything of similar nature resonates with you, please drop us a line. We would love to have a chat with you.